If you've tried dieting and exercising and still can't get rid of your stubborn fat, then SculpSure might be just what you need. SculpSure is a non-invasive laser treatment for the reduction of stubborn fat in areas like the abdomen and flanks. The procedure takes 25 minutes, is minimally painful, and requires no downtime. Clinical trials show an average of 24% reduction in fat volume after a single treatment. 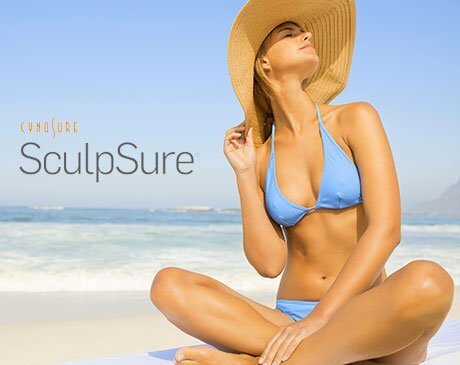 Holistic Medical Center proudly offers the sophisticated new SculpSure technology to help you meet your body image goals, with the best pricing on the island. Call us today! Do you have stubborn fat in your abdomen and flanks that you simply can't get rid of? If so, then the new revolutionary SculpSure body contouring laser treatment may be the answer you're looking for. Even with diet and exercise, most adults have stubborn areas of fat that seem impossible to get rid of. Now with SculpSure, you can target these problem areas in just 25 minutes, without surgery, incisions or downtime and achieve the shape you want. SculpSure brings the science of laser technology to the art of body contouring. At Holistic Medical Center we want you to not only "feel good" but "look good” as well! SculpSure is a state of the art laser technology perfect for patients looking to get rid of stubborn fat fast and effectively. It is the first FDA approved non-surgical body contouring system that can treat stubborn fat in areas such as the abdomen and flanks. The 25 minute procedure has minimal discomfort, no down time and destroys up to 24 percent of treated fat cells in one treatment. The laser selectively targets fat tissue below the skin. It literally melts the fat cells by raising the temperature to a range of 42-47 degrees C. The heating phase is then alternated with and a cooling phase. Once the fat cells are degraded the body then naturally eliminates them, with best results being seen at 12 weeks. The procedure is not considered painful, but rather a gentle warming and tingling sensation. The ideal candidate for SculpSure is an active and otherwise healthy person, but has stubborn fat that no amount of diet and exercise seems to help. SculpSure is the perfect bridge between diet and exercise. The important thing to remember with SculpSure is that it is not a weight loss device, rather a body contouring one. The number of treatments is based on your desired results. It will depend on the location and the amount of stubborn fat you have. Each treatment removes up to 24 percent fat. The treatment consists of 25 minute cycles of heating and cooling. Most patients feel a slight tingling sensation throughout the procedure, but tolerate it well. Some patients start to notice results as soon as 6 weeks after the treatment, however, best results are typically seen after 12 weeks. The greatest advantage of SculpSure is that the results are permanent. The treated fat cells are permanently destroyed and those cells will not reappear. There is no downtime with SculpSure so you can have a treatment during your lunch hour and return to work immediately. The number of fat cells in our bodies typically remains constant throughout adult life. As we lose weight , the size of the fat cells becomes smaller, but the number of fat cells stays the same. After SculpSure, the fat cells are permanently destroyed, and will not return.